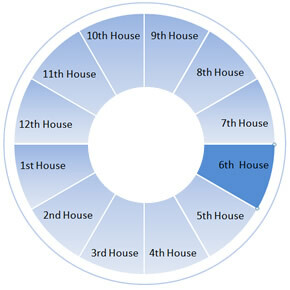 Traditionally, the venue of the sixth house pertains to issues of health (aka illness), work, and service. It is the area of the chart concerned with getting the job done, with little or no fanfare…just the daily grunt, given freely without expectation of reward. This is the house that deals with making the daily bread to feed the hungry because they need it. Making the daily bread involves knowing the details of how to make it and having the skills and willingness to do it. It involves taking care of those things and people who are your responsibility. There is a sense of duty involved with the sixth house, whether it is to your job, your family, or those who are less fortunate. You take care of them not because you have to but because it’s the right thing to do. The sixth house is where we build mastery of our trade. We work and work at it, learning how to be more practical and more efficient about it, reaching for some unattainable level of perfection. This is where structure and routine are comfortable. The health of your physical body is also the domain of the sixth house. Making the daily bread is a literal requirement in order to sustain the engines that run the body. “You are What You Eat” lives in the sixth house. When that breaks down, the body breaks down and we succumb to illness. The sixth house requires that we recognize the importance of nurturing ourselves as well as others.